Tropical Storm Nangka strengthened to a typhoon in the Northwestern Pacific Ocean just after NASA's Aqua satellite passed overhead on July 6. 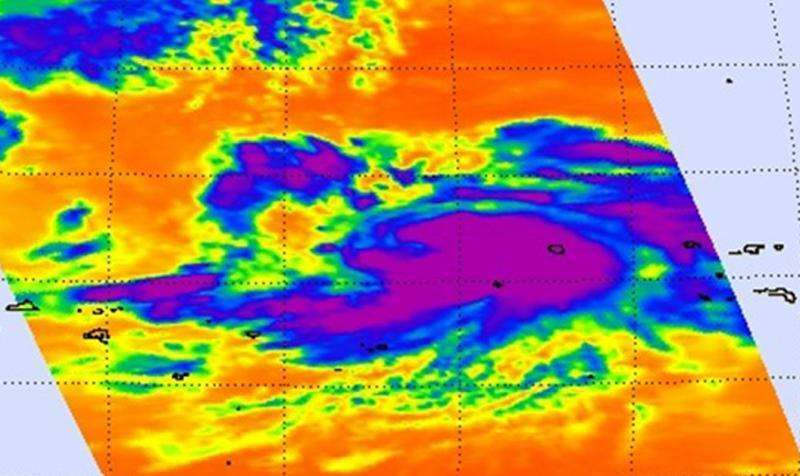 Infrared data from the AIRS instrument showed very cold cloud top temperatures indicating strong thunderstorms within the tropical cyclone. The Atmospheric Infrared Sounder or AIRS instrument that flies aboard NASA's Aqua satellite gathered infrared temperature data on Nangka on July 6 at 02:53 UTC (10:52 p.m. EDT on July 5). The coldest thunderstorm cloud tops measured were near -81 Fahrenheit or -63 Celsius. Cloud top temperatures that cold are high into the troposphere and capable of generating heavy rain. The infrared data also showed that Nangka had a good circulation and appeared rounded on AIRS imagery. At 1500 UTC (11 a.m. EDT) on July 6, Typhoon Nangka was about 242 nautical miles (278 miles/448.2 km) northwest of Ujelang. It was centered near 12.2 North latitude and 157.7 East longitude.Nangka was moving to the west-northwest at 11 knots (12.6 mph/20.3 kph). Nangka had maximum sustained winds near 80 knots (92.0 mph/148.2 kph), up from 70 knots (80 mph/129 kph) just six hours before. Nangka was a tropical storm on July 5 before Aqua passed overhead. As Nangka moves toward Micronesia and the Northern Marianas Islands, updated watches and warnings can be found on NOAA's National Weather Service page for Guam: http://www.prh.noaa.gov/pr/guam/. Nangka will move west-northwest, while intensifying steadily. The system will strengthen to 110 knots after two days and maintain that strength as it moves toward the northern Marianas Islands.